Larnaca International Airport is located 4 kms South West of Larnaca city in Cyprus. Larnaca is the largest of the two Airport in Cyprus the other airport being Paphos Airport which is situated in the West of the Island. Larnaca airport car hire network provides discount car rental from the following rent a car companies, Herrtz, Avis, Sixt, Europcar, rightcars, greenmotion. 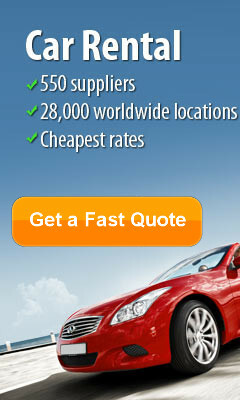 We shop around and compare car rentals prices in Cyprus to get you the cheapest car hire in Larnaca. Choose from economy cars Ford Fiesta VW Golf, People Carriers Ford Galaxy and VW Touran to open top convertibles and Jeeps. After collecting your luggage, please go through Customs and once outside the arrivals hall, turn right and follow the signs until you reach the Shuttle Bus Service Area. Please board the Goldcar's shuttle bus here (the bus will also have the Goldcar logo). This bus will take you directly to the GoldCar airport office located across the road from the airport terminal, just 5 minutes from the airport. When returning a Goldcar hire car please return to the same rental office, where you can avail of the shuttle bus to take you back to the airport. Full details and direction will be printed on your car rental voucher. 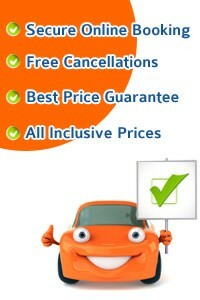 Take this opportunity to get the best car rental deals ar Larnaca Airport COMPARE & SAVE. Car Parking: Larnaca Airport has over 500 car parking spaces. Bus service: Larna Airport offers good facilities for disabled passangers. Disables Facilities: Larna Airport offers good facilities for disabled passangers. 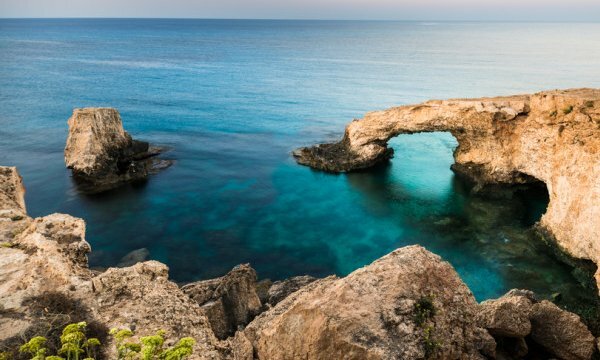 Perched on the southern coast of Cyprus, Larnaca is an interesting mish mash of commercial port, natural beauty and tourist resort. Based around the Marina, Larnaca also offers lovely sand beaches, a salt lake with abundant birdlife - especially when the flamingoes and swans flock into town – and palm-lined seafront promenades. There is plenty to see and do in and around the city, and the excellent weather makes it a good choice year round. For beaches, try the quiet seashore about 100m south of Larnaca Castle, or Foinikoudes, the main beach of Larnaca town. The Foinikoudes Promenade on the right hand side of Athinon Avenue is a perfect example of Cyprian palm-lined walkways and a hot spot for locals and visitors alike. Beaches in and around the city offer plenty of sun loungers, beach sports and sea-front eateries. For the more adventurous, there are underwater diving adventures available at the wreck of the Zenobia. Visit Larnaca castle for a taste of bygone days, and soak up more history in the Pieridis Museum of Antiquities. Tour the celebrated Ayios Lazarus, a small shrine built for Saint Lazarus, which still houses his tomb today. For theatre and art, head to the Cornaro Institute in the old town, a cultural centre which houses temporary exhibitions and events. Music lovers won’t be disappointed; there is a philharmonic orchestra, a fine range of year-round concerts and the locals are particularly proud of their 60-strong municipal band that plays everything from parades to traditional Greek favourites. Pick up your car hire at Larnaca Airport and head straight for an altogether different holiday experience: quad biking around Salt Lake. Offering some of the most spectacular scenery around Larnaca, the salt lake is the perfect place to get away from it all and explore some natural beauty. The lake is particularly impressive in the winter months when flocks of migratory birds such as flamingoes, ducks and swans arrive to feed in the abundant waters. There is also a mosque at the lake, complete with lush gardens and tombs. The mosque reflects beautifully in the clear waters during winter, creating a magical atmosphere and memorable experience. Another heavenly spot in the immediate locality is Kalavasos Dam; a remote and scenic area offering enjoyable hikes in a tranquil setting. Follow the old earthen road to view the remnants of an old working mine, or simply enjoy the gorgeous views of the countryside. Kalavasos village is also worth a stop off, if only to sample some of the local food and wander its quaint streets. On the outskirts of the village, seek out the old abandoned mine trains. is a city centre self catering hotel providing comfortable accommodation at reasonable prices. Only 10 minutes drive away from Larnaca International Airport, conveniently located in the heart of Larnaca surrounded by restaurants, bars and all kind of shops. The famous Palm Tree promenade and the long sandy beach of Larnaca city is just a 2 minutes walk away. Frangiorgio Hotel Apartments situated in the heart of Larnaca, these comfortable apartments offer a relaxing base, just steps away from the local boutique shops and the seafront. Frangiorgio Hotel is conveniently situated just 10 minutes’ drive from Larnaca International Airport. Its prime location allows you to easily access Larnaca’s major attractions. The comfortable studios and apartments are appointed with modern amenities, including a well-equipped kitchen and satellite TV. Throughout your stay you can also enjoy free wireless internet access in the public areas of Frangiorgio Hotel and free private parking. Larnaca’s sandy beach is just steps away from Frangiorgio Hotel. The Luxurious ‘residents only’ Le Meridien Limassol Spa and Resort is situated on 100,000 square metres of landscaped gardens and is Cyprus's only international five star chain hotel on the beach. The hotel is renowned for its award winning Spa, delicious range of dining options, unrivalled children’s facilities including Penguin Village and Leisure Land, and not forgetting its impeccable service and warm hospitality.